john jensen comment : Jim here: I loved the Dugans cup cakes just as you described. Iloved the 1/4 inch thick icing on them, used to peel off the icing and eat it first,then the cake. I was born and raised in Newark NJ, we had a Dugans bakery in Newark. I will always remember sitting on the porch during summer vacation and see the Dugans truck coming around the corner, Iwould run into, the house and yell to my mother, mommy the Dugans man is coming! Those were great times!!! In the mid 50's, our Dugan's driver lived in town (Paramus) and owned a chicken farm - he would let me ride with him (with my Dad's ok) in that crazy truck (with the creases in the engine hood) during his deliverys in Reid Way development in west side route 17 in Paramus, and on Sunday he would pick me up and go to his (gigantic) chicken coop (barn) on the east side of rte 17. In Southern California we had the Helms man. His mobile bakery was a pale light yellow panel truck loaded with bread, pies, doughnuts, pastries, and more. His signal was a slow alto pitched "TOOT TOOT." Helms Bakeries, based in Culver City, got its start during the preparation of the Los Angeles Olympics in 1932. The company provided bread for every US Olympic team between the first L.A. games and the Mexico City Olympics in 1968. They also provided bread for the first Apollo landing on the moon in July 1969, but the company filed for bankruptcy before the astronauts returned to earth. That's a nice memory JD. I delivered milk in the mid 60's to early 70's for Dairylea and ran into the Dugan bakery guys all the time. My mother had them deliver to our house too. One day I was transferring my load (moving full cases forward after removing and stacking the empty cases to the side of the truck) while parked under a shade tree. The Dugan's driver stopped under that shade tree and we both had lunch together. He shared a box of donuts and I shared a chocolate milk with him. Great memories of years gone by. There was a Dugan's outlet store on RT 46 in Lodi, NJ....every Saturday evening on our way home to Wayne - (before I-80 was constructed) - from dad's store in Fort Lee, we'd stop and get bread, coffee cake and crumbcakes (for Sunday mornings after Mass). We had a chest freezer and every Saturday night it was our job to get a frozen crumbcake out of that freezere in the garage and bring it upstairs so that it would be ready to eat in the morning...great memories...THANX!!! As a child I lived on the outskirts of Ossining, NY on Route 9 by the one time Croton River Bridge. The Dugan's Truck would visit our home leaving bread and pastry items. We moved from Ossining in 1955 and with that came an end to Dugan deliveries to our home. when u heard the brakes squeakin' u knew the do-nuts were getting close....YUM!! My dad was a driver for Dugans bakery. He started his day at the Atalantic Avenue facility in Queens. the specific cakes I remember were the crumb cake, the coffee cake ring, and oh those amazing cupcakes! As i recall there were 6 in a box. two covered with chocolate icing, two with vanilla, and two with strawberry icing! Yummy!!!!! I remember the Dugan's truck coming down the street. I specifically recall (with great pleasure) their crumb cake. Those were the days! This was in East Rutherford, N.J., about 15 min. outside NYC. 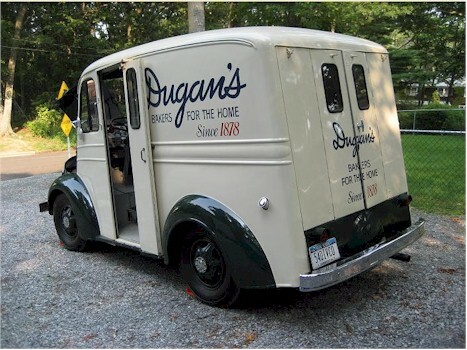 When I spent my summer vacations at my grandparents home in Far Rockaway Queens,NYC back in the late 1950's and early 1960's(Before I went to those horrible summer camps)..The delivery man from Dugan's would drop off his delivers of Dugan's breads,cakes,pies and donuts. Wow, Dugan's! One of the good memories of my childhood. Even though there was little money in our house, my Mother must have been taken by the friendly delivery man and his gentle sales' style. Those delicious whole wheat, blueberry muffins were such a big treat for us kids. This was Suffolk County, Long Island 1960. The Breadman delivering to my grandma's house in Independence, MO, always such fun deciding what to get, now I have to order online, wait for UPS! Ah yes, Dugan's. They delivered in Newburgh NY back in the late 1940's, and their door-to-door baked goods delivery competition there was Cushman's and Krug's. In our area, we had Helm's Bakery trucks, with long shallow trays that slid out of the back of the truck -- full of fresh, delectable breads, donuts, and other goodies. I loved it when my mom would let me go out to buy the breads we needed because she let me get a donut. Dugan's delivered to my Long Island neighborhood. I think we got doughnuts and muffins from them.